The Ford F-650/F-750 Super Duty series of commercial trucks have been in production since 2000. They were originally produced as a joint venture between Navistar International and Ford, although Ford has been the sole manufacturer of these trucks since 2014. Ford upgraded the gross vehicle weight rating (GVWR) of the 2011 F-750 to the Class 8 range, which is the highest weight rating for highway vehicles in the United States. 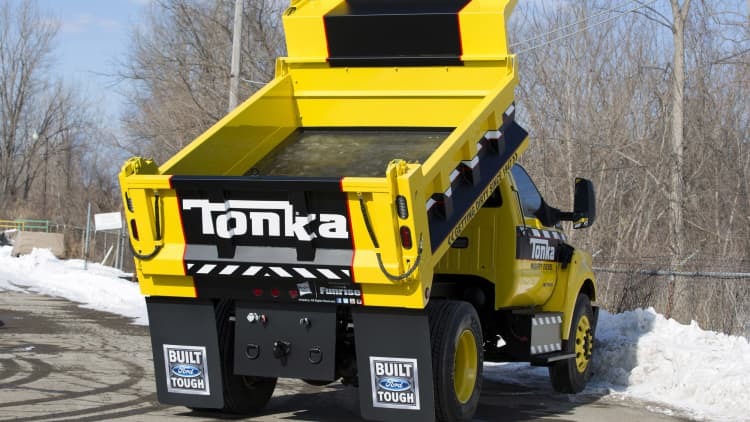 The Tonka trim level of the 2016 F-750 is intended to resemble a toy Tonka truck and will be available to consumers in the summer of 2015. The 2016 model year marks the debut of the second generation of the F-650/F-750 series. Ford introduced this model at the National Truck Equipment Association Work Truck Show in 2014, which will include many changes. Ford discontinued its Econoline series of vans and truck chassis in 2014, so the F-650/F-750 series is now being made at the assembly plant in Avon, Lake with the F-53/F-59 series of front-engine commercial chassis. The most distinguishing features of the 2016 Ford F-750 Tonka truck are its signature yellow color and dump body. The new F-750s also have a new hood with a larger grille and headlights. The new grille has a blackout nostril that improves airflow for greater engine cooling. The fully-functional dump body is a dock-height, straight-frame body that was designed by Truck Tech Engineers. A tractor version of the Tonka truck is also available for heavy towing applications. The cab of the Tonka truck is a carryover and is available in regular, crew and super styles. The standard engine for the F-750 Tonka is Ford’s 6.7-liter Power Stroke V8 diesel engine, which also operates the dump body with its power takeoff provision. The proven Power Stroke engine also powers field equipment such as cranes. This engine is available in multiple tunings that allow customers to scale their engine power according the required application. The standard tuning for the Power Stroke engine is 270 horsepower (HP) with 675 pound-feet (lb.-ft.) of torque. Additional tunings available for this engine in the Tonka include 300 hp with 700 lb.-ft. of torque and 330 hp with 725 lb.-ft. of torque. The F-750 Tonka is also available with a 6.8-liter V10 gasoline engine, which provides 320 hp and 460 lb.-ft. of torque. It’s now the only gas engine offered for a medium-duty truck. It can also be modified at the factory to use compressed liquid propane or natural gas as more cost-effective fuel options. The standard transmission for the F-750 Tonka is a six-speed TorqShift HD automatic transmission that’s designed for performance and dependability. Its first gear has a drive ratio of 3.97, which is a low-end gear for this class. The TorqShift transmission also has a double-overdrive design for improved fuel economy at cruising speed. This transmission has a SelectShift feature with two modes that the driver can select. The Progressive Range Select mode allows the driver to limit the gears that the transmission can use, which is typically used to achieve a constant speed over hilly terrain. The Full Manual mode allows the driver to manually select the gear for complete control over the transmission. The Tonka’s GVWR of 33,000 pounds is supported by a 158-inch wheelbase. The dump body can carry up to 8.5 tons, and is typically used to haul loose cargo such as sand or gravel. The space behind the cab of the Tonka has been redesigned to accommodate the customized bodies that are often used by ambulances, dump trucks and tow trucks. The Tonka is available with the PowerScope trailer that has additional mirrors to help the driver with hauling and towing heavy loads. These mirrors include large mirrors for general use as well as smaller mirrors specialized for spotting. They also have a power telescoping feature that’s exclusive to this market segment. The 2016 F-650/F-750 has received modifications to reduce the noise level inside the cab, including changes to the engine’s combustion system and strengthening the engine’s structural integrity. These changes lower the interior noise level by 25 percent at 60 mph and 45 percent at idle.